Every so often during research, seemingly unrelated threads come together flawlessly. Take, for instance, my interest in the Deputy Secretary of Xinjiang’s Propaganda Department Ma Hanbing (新疆分局宣传部副部长马寒冰). Ma, from what I gathered, served in that department from 1949 to 1953 before moving onto Beijing to work in the Ministry of Culture (文化部). Ma was a famous lyricist and an often-published journalist. Looking at the titles of his publications, however, I could never understand why in 1956 he had a body of work called “The Nile River” (尼罗河畔). The title “The Nile River” looked out of place next to all of the poems and songs about Xinjiang. But Ma’s “Nile River” made so much more sense after I put together a recent post on Burhan Shahidi (包尔汉). How does Burhan Shahidi fit in with Ma Hanbing’s poem on the Nile River? Burhan Shahidi led the Chinese Culture and Art Troupe (中国文化艺术代表团) across the Middle East and Africa from February until June 1956, which Ma Hanbing was also a part of. The delegation visited Sudan, Ethiopia, Syria, Lebanon, and Egypt. Dru Gladney has called delegations like these (led by a Muslim leader who travels to Islamic countries) China’s way of playing the “Islamic card.” Although Ma was not a Muslim, his experience working in Xinjiang undoubtedly factored into the decision to send him abroad with Burhan. Ma Hanbing served as the Troupe’s Deputy Chief and as the Art Director (文化艺术代表团副团长兼艺术指导). 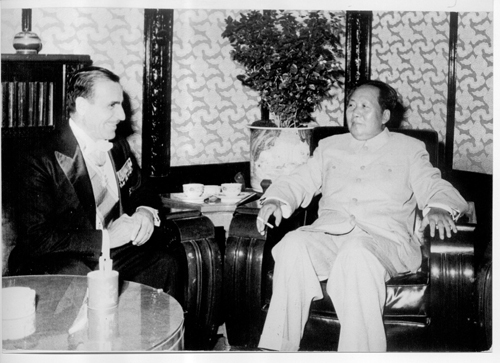 Mao Zedong with Egyptian Ambassador Hassan Ragab on September 17, 1956. Image courtesy of the Chinese Embassy in Egypt. Along with Burhan Shahidi and 165 others, Ma was selected as a Member on the Committee of Chinese People who Support Egypt in Fighting Against the Invasion by the British and French (中国人民支援埃及反抗侵略委员会委). On November 5, 1956, one day prior to the Suez cease-fire, Ma wrote an essay for People’s Daily (人民日报) on a famous Egyptian song “Egypt — Our Mother” (埃及–我们的母亲). Ma described the song’s cultural significance after the Suez Canal crisis and how he often overheard members of the public and the army singing the song at events and on the street. 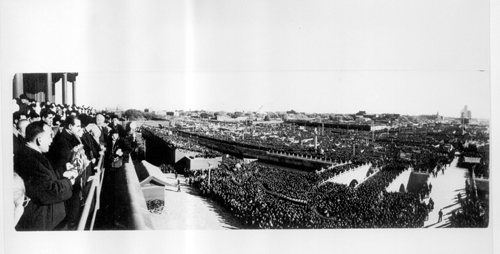 A November 3, 1956, rally in Beijing in support of Egypt. Image courtesy of the Chinese Embassy in Cairo. the war still raging in Cyprus, in Algeria shots ring out. again we cannot be fast asleep. use our blood and our heads to fight. After being publicly shamed, Ma Hanbing committed suicide in 1957 at the age of 41. In 1989, however, it seems Ma Hanbing’s image was restored. In Urumqi, Ma Hanbing’s Selected Works (马寒冰文集) were published with glowing prefaces written by Deng Liqun, Wang Enmao, and even a few photos of Wang Zhen paying his respects at Ma’s grave. Today Ma is especially well-remembered for the song he wrote, “Xinjiang is Good” (新疆好). “Xinjiang is Good” can be read in translation in Nimrod Baranovitch’s China’s New Voices: Popular Music, Ethnicity, Gender, and Politics, 1978-1997 (University of California Press, 2003), linked here on Google Books.